Wow! I do not think I can accurately put in to words how special this books is. On the surface, the plot seems very simple, but there is so much depth and the story is more complex than it may first appear. It would have been so easy for the plot to lose it’s way, but it never does. I could not put this book down. I finished it in two sittings, and when I wasn’t reading it it was always on my mind. Even now, a week after I finished it, I think about it often. Sally Rooney portrays such a honest and real relationship in a way that I do not think has ever quite been captured so perfectly before. Normal People is an interesting look at how someone can make you the best and worst version of yourself all at the same time. I appreciated that both of our main characters are flawed and imperfect. There is definitely character development, but not to the point where it is unrealistic or that they lose her they truly are. Normal People is unique in that it is about a relationship, and I would say it is a love story, but it is not romantic. There are romantic moments, but it is not all sunshine and rainbows. It is so honest and raw. I think many of us will see parts of ourselves in these characters. Normal People is also a commentary on race, class, and socioeconomic status. It is also a real look at the confusing transition from high school to university. There are a lot of subtle and meaningful themes throughout the novel. Wholeheartedly YES! If you enjoy flawed characters who you still root for this is the book for you. Just know going in that there are triggers for abuse, suicide and suicidal thoughts, and depression. Thank you to Penguin Random House Canada for sending me a copy of Normal People in exchange for an honest review. Great review! I was blown away by this book as well. Thanks! I had only heard good things about it but was still taken back by just how good it was. This sounds like a really good book to read! Would you say that the suicidal thoughts are very high? Just curious as am worried it might trigger me a bit much. It’s really great. A character commits suicide (off the page) which leads to some suicidal thoughts in one of the main characters. It’s very brief and we don’t find out about it until he is seeking help from a therapist. I hope that helps! Fab review, I will add this to my wishlist – Thank you for the recommendation. Then you’ll so love this one. She really pulls it off! I read some negative reviews and saw se valid points. I could see how it would not be loved by everyone! So glad you loved this!!! Rooney is such a talent. She really is. I’ll probably read anything she writes now. Thank you. I can not wait to see what you think of it! Oh good to know. I definitely haven’t heard as much about Conversations with Friends as I did with Normal People. I’ll go in to it with lower expectations. Glad to see that this builds on the themes Rooney began exploring in Conversations with Friends – really excited to read this later in the month. Excellent review! Interesting! I actually know nothing about Conversations with Friends so I’m curious to get in to it. I hope you enjoy this one! Oh, awesome. I am curious about the audiobook! Yay! I can’t wait to see what you think! I’m glad you loved this one! 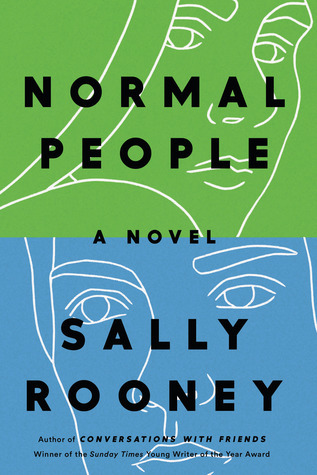 Normal People is one of my favorites on the Women’s Prize list, and Sally Rooney is fast becoming a favorite author. I loved how understated and brilliant this story is. I completely agree with you. I will be so disappointed if it’s not shortlisted. Everything about it just worked.